The vulnerability has been uncovered by Google's Project Zero vulnerability reporting team, and one of its researchers Tavis Ormandy has also posted a proof-of-concept attack—just 40 days after the initial report. Usually, Project Zero team discloses vulnerabilities either after 90 days of reporting them to the affected vendors or until the vendor has released a patch. However, in this case, the Project Zero researchers disclosed the vulnerability 50 days prior to the actual time limit because Transmission developers failed to apply a ready-made patch provided by the researchers over a month ago. "I'm finding it frustrating that the transmission developers are not responding on their private security list, I suggested moving this into the open so that distributions can apply the patch independently. I suspect they won't reply, but let's see," Ormandy said in a public report published Tuesday. The PoC attack published by Ormandy exploits a specific Transmission function that lets users control the BitTorrent app with their web browser. Ormandy confirmed his exploit works on Chrome and Firefox on Windows and Linux (Fedora and Ubuntu) and believes that other browsers and platforms are also vulnerable to the attack. Transmission BitTorrent app works on server-client architecture, where users have to install a daemon service on their systems in order to access a web-based interface on their browsers locally. The daemon installed on the user system then interacts with the server for downloading and uploading files through the browser using JSON RPC requests. Ormandy found that a hacking technique called the "domain name system rebinding" attack could successfully exploit this implementation, allowing any malicious website that user visits to execute malicious code on user's computer remotely with the help of installed daemon service. The loophole resides in the fact that services installed on localhost can be manipulated to interact with third-party websites. "I regularly encounter users who do not accept that websites can access services on localhost or their intranet," Ormandy wrote in a separate post, which includes the patch. "These users understand that services bound to localhost are only accessible to software running on the local machine and that their browser is running on the local machine—but somehow believe that accessing a website "transfers" execution somewhere else. It does not work like that, but this is a common source of confusion." 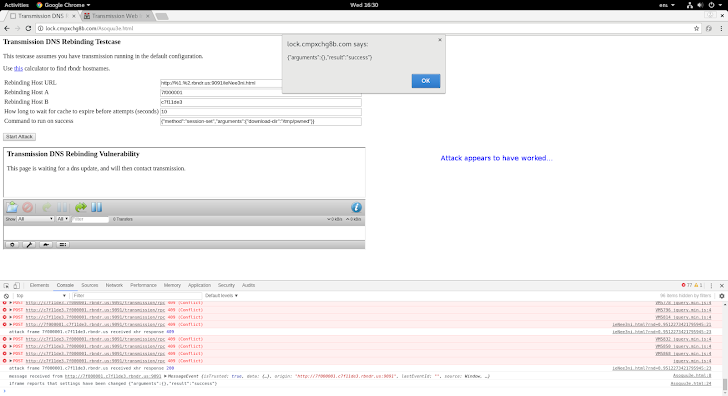 A user visits malicious site (http://attacker.com), which has an iframe to a subdomain controlled by the attacker. The attacker configures their DNS server to respond alternately with 127.0.0.1 and 123.123.123.123 (an address controlled by the attacker) with a very low TTL. When the browser resolves to 123.123.123.123, it serves HTML that waits for the DNS entry to expire (or force it to terminate by flooding the cache with lookups), then it has permission to read and set headers. A fix is expected to be released as soon as possible, a development official with Transmission told ArsTechnica, without specifying an actual date.